Increasingly, one of the latest reactions to the evangelical gender debate among some younger Christian women is “I am neither complementarian nor egalitarian,” inviting the reply: So, then, what are you? And, why do you respond in this way? Michelle Lee-Barnewall, associate professor of biblical and theological studies at Talbot School of Theology at Biola University, gives voice to this relatively recent group. She presents herself as neutral and objective. She thinks neither view is the “biblical view” (1). In this book, she does not clearly answer, “So, what can women do?” (167), although she herself teaches Bible to adult men and women. She is repelled by egalitarians yet not attracted to rigid hierarchists, so she settles for a moderate complementarian position. The following quotations summarize her critique: “Promoting personal rights is intrinsically about what benefits or is fair to the individual rather than building relationships between individuals. Authority may provide order and efficiency but not intimacy” (175). “Does a focus on male authority lead to improper attention on and status for those in leadership instead of God, whose servants they are, or the members of the body of Christ, whom leaders are called to equip? Does an emphasis on rights feed an unhealthy desire to satisfy our own needs rather than seeking God first in humble dependence and obedience?” (177). The book has two parts with eight chapters. Part 1 deals with “Gender in Evangelical History.” Chapter 1 overviews the first wave of feminism, post-Civil War America through the early 1900s, where women’s domestic sphere was enlarged to the public world as a moral duty since women were regarded as the moral guardians of society (31, 33). She contrasts Victorian women with the egalitarian movement in the 1970s, which promoted equal rights. Victorian women defended women’s interests “only within the framework of an acceptance of male dominance” (33, 35). Chapter 2 overviews the end of World War II and the 1950s. While during World War II an estimated thirty-six percent of adult women worked outside the home, after the war women either left work voluntarily or were forced to give priority to returning servicemen (37). The ideal was that a mother would be the homemaker and the father the breadwinner (39). Women’s sphere was restricted to the home (47). Chapter 3 overviews the “second wave feminism” of the 1960s and 1970s, where concerns about individual rights, personal fulfillment, and equality predominated, while abolishing roles based on gender (49–50, 64). As the antislavery movement in the nineteenth century was a catalyst for the first feminist movement, civil rights may have been a catalyst for the second feminist movement (54). Lee-Barnewall believes that by introducing what she calls kingdom categories and priorities, “such as the unity of the body of Christ, a theology of ‘reversal,’ and the holiness of the people of God” (also sacrifice and love [67, 148]) she “provides a better overall perspective from which to understand how women and men fit into” God’s plans. In Part 2, “Reframing Gender,” Lee-Barnewall looks at the Bible. In ch. 4 she presents her two foundational kingdom themes: “(1) unity and the corporate identity of God’s people and (2) the way in which ‘reversal’ demonstrates the power and glory of God in the Christian community” (71). This introductory biblical base is followed by ch. 5 against egalitarians (“Rethinking Equality and Rights in the Body of Christ”) and ch. 6 against complementarians (“Rethinking Authority and Leadership in the Body of Christ”). In ch. 5, she concludes that equality is not “the primary guiding point,” rather love is more important than individual rights (84–85). She supports “inclusion,” not equality between women and men (84, 66, 101). Giving up rights is more important to her than obtaining rights (101, 175). In the church, hierarchy and authority remain. The Twelve had a higher status than the other disciples; elders have a double honor. Elders and teachers are more important than prophets (91–92, 97–98, 101). In this chapter, she ignores 1 Cor 12:28 where apostles and prophets have precedence over teachers (though she does utilize 1 Cor 12:28 later for a different purpose, 172). In ch. 6, she observes that complementarians see authority as prominent and foundational and “servant” as a mere modifier for leadership (104, 107). Rather, to her “one must be a servant before one can be a leader” (107). She appears to believe that the NT “certainly affirms the validity” of a “special male leadership role” and the “centrality of authority” (hence my observation that she is actually complementarian). But these males should be reformed according to Christ’s example of sacrificial servanthood which is other-oriented, bringing unity to the church (118–19). “Being a servant or slave in the ancient context meant a deep loss of status and honor” (118). Chapters 7 and 8 overview marriage: Adam and Eve in Gen 2–3 (ch. 7) and husbands and wives in Eph 5 (ch. 8). Her own view on gender roles comes out most clearly in these chapters. For example, she writes in a footnote “while both [the man and the woman] are told to ‘subdue’ the earth and to ‘rule,’ this does not necessarily mean that they share equally in these tasks” (127). 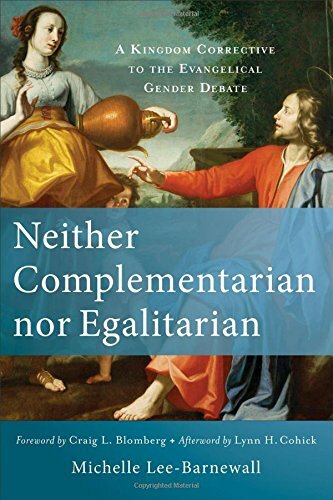 As do many complementarians, she highlights Gen 2 over Gen 1, concluding that Eve is primarily Adam’s helper, the same but not equal to Adam, because of her sequential creation (129, 135–37). Adam is primarily responsible to keep God’s commands and create unity (142–45). Although she understands “head” (kephalē) in Eph 5 as a metaphor of prominence, referring to the husband’s leading role in the body, this “head” sacrifices himself for the “body,” the wife, in reverse to ancient Greek and Roman culture (154, 156–57, 162). The sacrificial love of the husband is the initiating action to which the wife responds (161–63). Instead, in Genesis, Adam as husband was “willing to sacrifice” Eve by trying “to place the blame on her in an attempt to save himself” (163). Thus, Lee-Barnewall sees that the kingdom of God transforms the ancient view of headship (166). “Headship” should manifest itself through “sacrifice and love” (166). “Equality” is a biblical word: isos, isotēs. Paul refers to “equality” in financial income in the church: “At the present time your plenty will supply what they need, so that in turn their plenty will supply what you need. The goal is equality . . .” (2 Cor 8:14 NIV, cf. Matt 20:12). “Equality” is a synonym for “justice” between masters and slaves because human masters have a heavenly Master (Col 4:1). Jesus making himself “equal” to the Father was considered blasphemy by his enemies (John 5:18). Gentiles are “included” in God’s kingdom because they have received “equal” gifts to the Jews (Acts 11:17, 2 Pet 1:1). Philippians 2:4 can be misunderstood: Is it “Let each of you look not to your own interests, but to the interests of others” (NRSV) or “Each of you should look not only to your own interests, but also to the interests of others” (NIV 1984, italics added)? Should “also” be in the Greek text and thus in English translation? The best ancient manuscripts retain “also,”6 whereas a few later texts remove “also.”7 Jesus was “equal” with the Father, but did not let that fact keep him from humbling himself by becoming human and eventually dying on a cross (Phil 2:6–8). Jesus defended his own rights when he did not allow himself, until he was ready, to be arrested and killed (e.g., Luke 4:28–30). So did Paul insist on his rights as a Roman citizen (Acts 16:37–39, 22:25–29). If women are not equal to men, their sacrificial love has little significance. It is simply their lot in life. When Paul discusses the importance of love over knowledge, he includes issues of freedom to eat all foods, topics not essential to salvation or to social justice. But when the Greek widows were being neglected in the daily distribution of food in Jerusalem, the disciples did not say equal distribution is not important. Rather, they set aside disciples, all with Greek names, to oversee the food distribution (Acts 6:1–6)—then the word of God increased (6:7). Concern for the oppressed or needy is an ongoing biblical principle, because our God is not partial and is concerned for justice (Deut 10:17–18). Therefore, God approved the daughters of Zelophehad when they stood up for their rights and asked for a possession (Num 27:1–7).8 In effect, we should look out for others’ rights, rather than greedily push forward our own “selfish ambition” (Phil 2:3). We should keep in mind others’ interests as much as we keep in mind our own. If no other Christian is looking out for our interests (which they should be), then speaking on behalf of our rights would fit under the category of speaking to a brother or sister if they “sin against you” (Matt 18:15–17). They probably do not even realize they have sinned against you unless you explain it to them. Lee-Barnewall’s desire to find another gestalt to end the impasse between complementarians and egalitarians is a worthy one. To look to the Bible for that gestalt is most appropriate for Christians. As a result of reading Neither Complementarian nor Egalitarian, we may rightfully ask these questions: Is my quest for my rights simply self-serving, or does it advance God’s kingdom? Is it a loving act? Am I hesitant to speak for others’ rights because of the cost entailed? Is my leadership a sacrificial service for others? Does the unity I advocate help those who are now oppressed or simply extend the power of those who think they are entitled? Am I seeking to be in power simply for my own selfish ambition or to serve a calling from God? Do I promote certain gender roles because of cultural pressures or because I genuinely believe they are biblical? Lee-Barnewall may have forgotten that she can indeed serve as a professor of Bible and theology because of the sacrificial struggles and perseverance of many devout Christian women and men who worked hard to teach the conservative Christian church that, according to the Bible, God does want and does bless orthodox women who teach with authority. People who have been oppressed by others are sometimes more sympathetic with the need to fight for rights. A more irenic approach could have better won over the oppressive complementarians and the egalitarians she hopes to change. 1. For example, “Who Is Generation X?” http://www.jenx67.com/who-is-generation-x, accessed 2 May 2016. Ministry (Grand Rapids: Baker, 1985), 23–29. 2. See Aída Besançon Spencer, Beyond the Curse: Women Called to Ministry (Grand Rapids: Baker, 1985), 23-29. 3. See Aída Besançon Spencer, “Peter’s Pedagogical Method in 1 Peter 3:6,” BBR 10, no. 1 (2000): 107–19. 88–92; “From Poet to Judge: What Does Ephesians 5 Teach about Male- Female Roles?” Priscilla Papers 4, no. 3 (Summer 1990): 10–16. 5. See further Aída Besançon Spencer, “Position Reversal and Hope for the Oppressed,” in Latino/a Biblical Hermeneutics: Problematics, Objectives, Strategies, ed. Francisco Lozada Jr. and Fernando F. Segovia (Atlanta: SBL, 2014), 95–106. 6. Including Alexandrian manuscripts such as Papyrus 46 from c. AD 200 and the fourth-century codices Sinaiticus and Vaticanus, as well as the majority of manuscripts and essentially all printed Greek New Testaments. 7. Including the sixth-century codex Claromontanus, three ninth- century codices, and some Latin manuscripts. 8. See Aída Besançon Spencer et al., The Goddess Revival: A Biblical Response to God (dess) Spirituality (Eugene: Wipf and Stock, 1995), 179.